This stylish and compact Storm 3 Ball Tournament Roller/Tote has many features packed into its design. This bag is made with durable 600D Polyvinyl material, and has reinforced zippers with large zipper pulls for your convenience. Use this bag for all your bowling trips! Plus, it's also optimal for airline travel! does it have wheels ? Hello, yes this bag has wheels. Hello! This bag weighs 4.5 pounds. Thank you for your question! Hello Mike! These wheels are 2.5 inches in diameter. Hello Mike! No, there is a strap used to pull the bag, but no proper, extendable handle or anything like that. 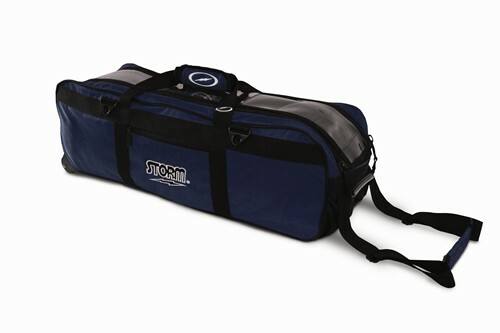 Due to the time it takes to produce the Storm 3 Ball Tournament Roller/Tote Navy ball it will ship in immediately. We cannot ship this ball outside the United States.